You can disable deprecation warnings by setting `Error.errorLevel` to `E_ALL & ~E_USER_DEPRECATED` in your config/app.php. Advanced Magnesium Synergy is a factor in the maintenance of good health, helps the body metabolize nutrients and in the development and maintenance of cartilage, bones and teeth. It is a source of antioxidants that helps to fight, protect cells against and reduce the oxidative effect of the oxidative damage caused by free radicals. Non-medicinal ingredients: sodium bicarbonate, citric acid, lemon flavour, monk fruit extract, xylitol, stevia, sodium stearyl fumarate. 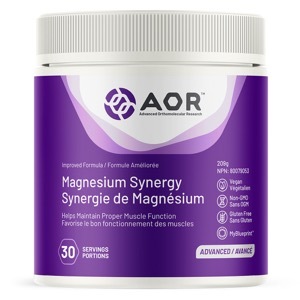 Advanced Magnesium Synergy is specially formulated to promote optimal absorption of magnesium into the cell, where it is needed the most, without negative side effects at therapeutic doses. This formulation helps in energy metabolism and tissue and connective tissue formation and provides electrolytes for the maintenance of good health, while providing support for healthy glucose metabolism and the maintenance of healthy skin and immune function. ADULT DOSAGE: Take 1-2 scoops daily, with food. Take a few hours before or after taking other medications or natural health products. Mix product well in 250-500mL of liquid (water, juice, etc.) immediately before consumption. CAUTION: Consult a healthcare practitioner for use beyond 6 months. Do not use this product if you are pregnant or breastfeeding. Do not use with other potassium-containing supplements or with potassium-containing salt substitutes.